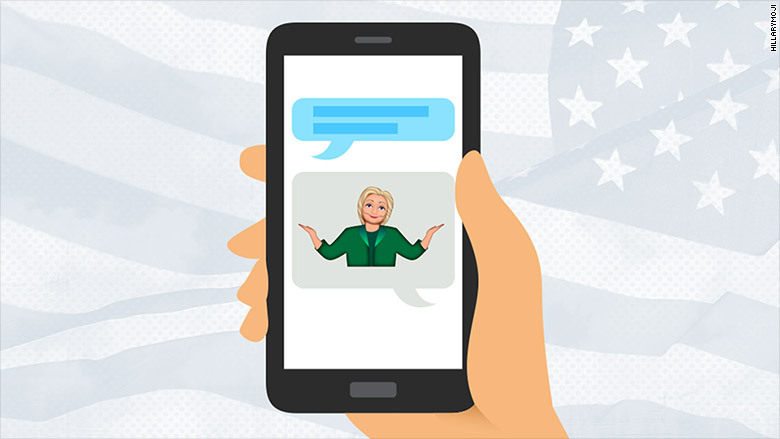 Can Hillary Clinton emojis win over the Snapchat generation? Emojis might just be the political cartoon for the Snapchat generation. That's the thinking behind a new iOS emoji keyboard called Hillarymoji. The keyboard hit the Apple store on Thursday with 20 Hillary Clinton-related stickers. It features emojis like Clinton sporting a T-shirt that reads, "The future is female," Clinton channeling "Rosie the Riveter," and a pink credit card that reads "Woman Card" in a nod to Donald Trump's now infamous phrase. 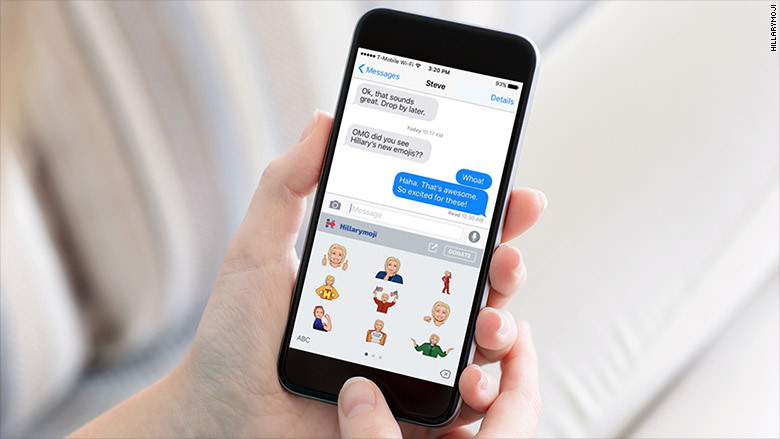 The goal behind Hillarymoji is to get the younger generation politically engaged. "It's a group she has got to bring over from the Bernie [Sanders] camp. It's another tool to the arsenal to help do that," said Dave Renz, cofounder of software development consultancy Tanooki Labs and cocreator of Hillarymoji. "We're very focused on fact that these can't be stupid emojis. We put a lot of thought into making it conversational so they'll actually be used." But unlike other emoji keyboards, it's not all entertainment. In addition to sending stickers to friends, there's also a call-to-action in the keyboard itself that directs people to Clinton's donation page. Those who donate will have access to a special Clinton emoji. The creators -- who also include attorney and entrepreneur Matthew Tollin; emoji designer Katy McCarthy; strategist Challen Hodson; and philanthropic adviser Wayne Farmer -- want to see how successful emojis can be in converting texters into donors. The Clinton campaign isn't affiliated with the keyboard, but the creators said they have notified her campaign that they've developed it. Just as Barack Obama successfully banked micro-donations from supporters through email fundraising campaigns, they hope emojis will be the next big tool for activism. Related: Who's donating to Trump? This bot will tell you. The idea for Hillarymoji stemmed from another keyboard they're developing, an "Emoji for Good" concept. The idea is to partner with nonprofits to develop relevant emojis that engage a young audience and allow people to make donations. According to Renz, Apple (AAPL) makes it difficult to donate directly through iOS apps which is why they're linking to Clinton's donation page for now. The team is working on a way to let people donate via text message (which would require partnering with the Clinton campaign directly) to make it even more seamless. "We hope to start incorporating that over the next couple of weeks," said Renz, who added that they'll continue rolling out new emojis that are related to news events.